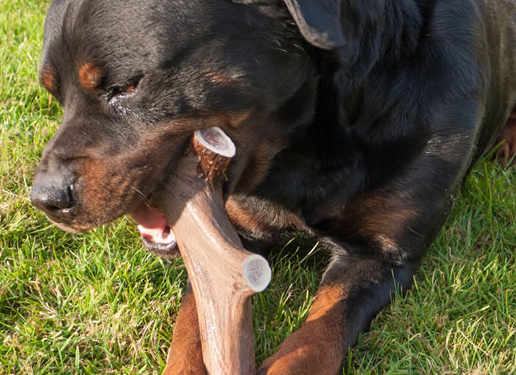 Antlers are composed of a bone-like material which consist of calcium and phosphorous, both are excellent for your dog’s bones, teeth, gums, and coat. 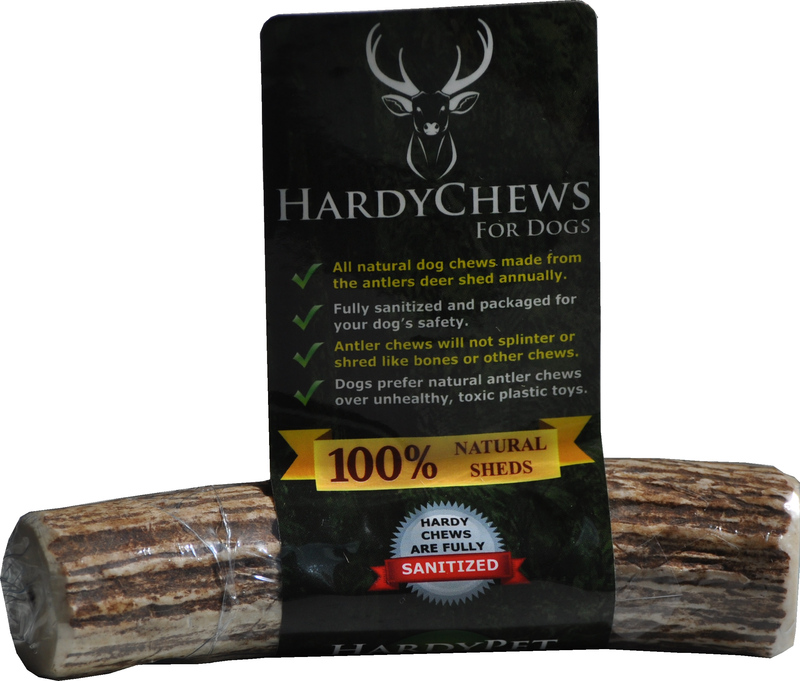 HardyChews are all natural, won't splinter, are odorless, contain no additives or preservatives, are allergen-free, long-lasting, not messy. The Best Dog Chew Available. Antlers are unique to the deer family and are composed of a bone-like material which regenerates each year and “branches out”. 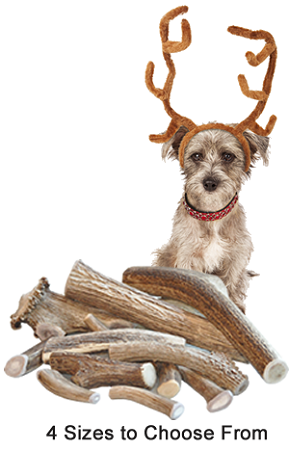 The hardened antlers are excellent chews for your dog because they contain rich amounts of calcium and phosphorus. Calcium plays an important role in your dog’s bodily functions such as bone and teeth formation, blood clotting, milk production, muscle contraction, heart pumping, vision, and in the metabolism of hormones and enzymes. Where do antlers come from? Antlers are unique to cervids and found mostly on males. In fact, only caribou and reindeer have antlers on the females. They start growing in the spring time then are shed each winter. The largest antlers may be 3-4 ft long and weigh around 40 pounds. Antlers are made of a tough bone which can grow at a rate of about 1 per day. While actively growing, the antlers are protected by a soft layer of highly vascularised skin known as “velvet”. The velvet is shed in the summer when the antlers have fully developed. Only then the antler formed. What else are shed antlers used for? In the United States, hard antlers are mainly used for two purposes: food/chew purpose and arts/craft. Only 10% of antlers are suitable for craft uses. They’re selected for their artistic shapes and colors. Craft products range from chandeliers to simple knife handles, and all kinds of fancy home furnishings. Why Cleaning and Sanitizing Something Natural? Since antlers are naturally shed in the wild, then picked by locals or antler collectors, there is always the possibility of contamination by bacteria or other pathogens. Every HardyChew is sanitized through a proprietary FDA approved "Food Grade" sanitation process which removes the possibility of contamination for you and your dog. Each antler is then sealed immediately after sanitizing to maintain cleanliness until delivered to you.